Building on a highly successful 2018, Huawei came into the new year with a bang. Earlier this week the company officially unveiled its brand new P series flagships in Paris. 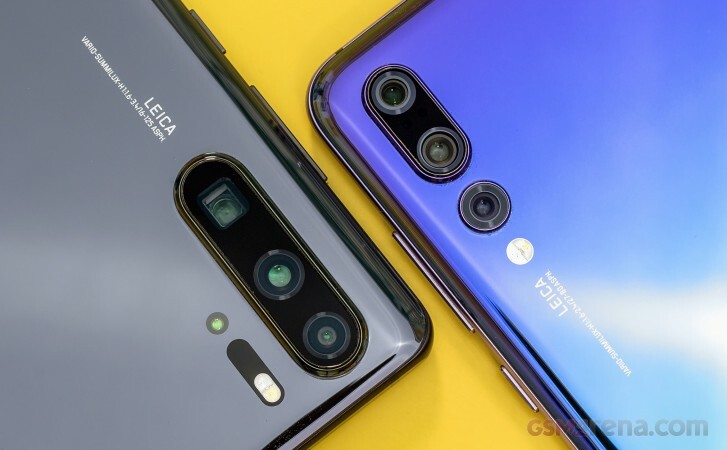 The new phones offer refinements across the board compared to last year’s models and are yet again attempting to revolutionize mobile photography. 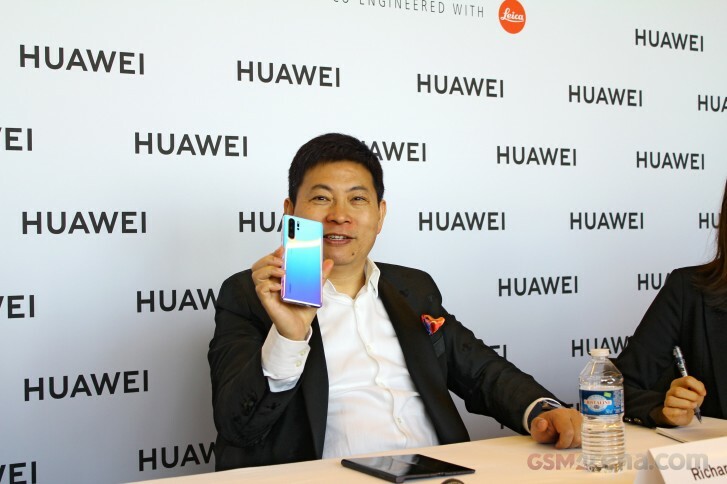 As one of the forerunners in the race to 5G, Huawei surprisingly didn’t announce any upcoming 5G devices during the event but we managed to get some insights on the company’s approach going forward. Sure, the new P30 and P30 Pro are not the perfect smartphones for everyone but as an overall package they are arguably class-leading. Huawei has been polishing its flagships year over year and the P30 series devices offer the best hardware and feature in the manufacturer’s lineup yet. After the keynote, we joined other members of the media for a press meeting with Huawei's CEO Richard Yu to hear his thoughts on the P30 series cameras, the state of foldable phones, 5G deployment, AI functionality, and the competition. You put a lot of emphasis on the optical zoom capabilities of the new phones can you talk a bit more about it? Also, your selfie camera does not support autofocus, it's just fixed so can you talk a bit more about that? The new 5x zoom is very meaningful. If you want to take photos at a distance it's always handy. I think the zoom feature is definitely in strong demand and we are proud to introduce it to our flagships. As for the front camera, you usually take photos from a fixed position when your arm is extended so you don’t need autofocus for that. It's more important to use the best sensor possible as we did. Our 32 MP sensor will help you take good photos even in low light and other difficult environments. It's not meaningful to include autofocus for the front camera. We care more about the real world consumers experience. Also if we had autofocus in the front camera, the notch would have to be larger and we did not want that as the design would be compromised. The P30 Pro does not have the option to record 4k at 60fps, what is the reason behind that? There are two main reasons for this. First of all the benefits of 4K can only be seen on a very large screen and it makes little sense to have it on your phone. Secondly, it takes up a lot of storage to record in 4K so you will quickly run out of space and that's a nightmare for consumers. We recommend users to leave the video recording resolution to FullHD, it's more than enough. 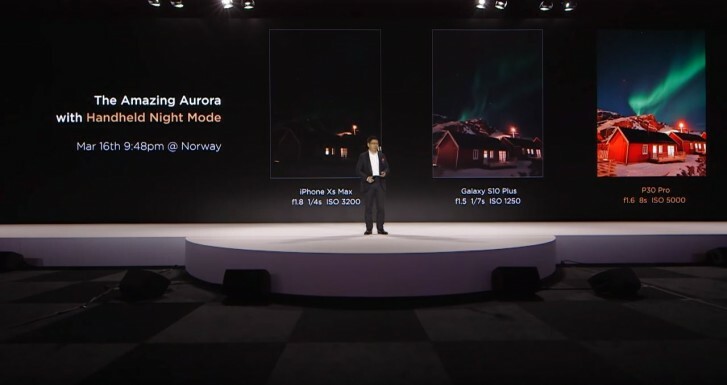 Last year you showed us with the P20 series that your cameras are some of the best in mobile devices, do you still think it is necessary to compare yourselves so strongly with Apple and Samsung live on stage? Our camera is the best but [still] many people don’t know that and that's why we had the comparison [on stage]. We want more people to know that if they want the best they should select Huawei. It's our confidence, so we can say we are the best. Yesterday Apple introduced its video streaming service, do you think that services and not products are the future of tech companies? Do you have any plans to introduce your own streaming service? I think its a good move for Apple, I think it's difficult for them to compete with us on the hardware front and of course services will bring in cash flow and revenue so it's a good choice. What Apple is doing is good and it's the right thing for them, of course, they will have to compete with Netflix and all the other video streaming services and it really depends how good they can compete with them. For us, we are not planning to compete in the streaming service sector outside of China. We have partnerships with video companies and we prefer to give the consumer a choice to select their own streaming service. I think that Apple is lacking in terms of product hardware innovation and that is why they are venturing into services. You also introduced the digital car key functionality, and for now, it’s an Audi exclusive, what are the next car brands we can expect to feature the key-less entry? It’s a work in progress, we’ll have BMW, Volkswagen, and all the other big companies. We hope it will be available soon on current generation cars but it depends if they support NFC. We are ready on our part and we hope with time all car models will be supported (at least middle-tier to high tier). Looking at foldable devices in general and the Mate X in particular, what market share do you see for foldable devices compared to other form factors (can you give us a percentage)? Well, currently, folding phones are just in the beginning and the market share is small, they cost a lot and it's very expensive to produce such devices. 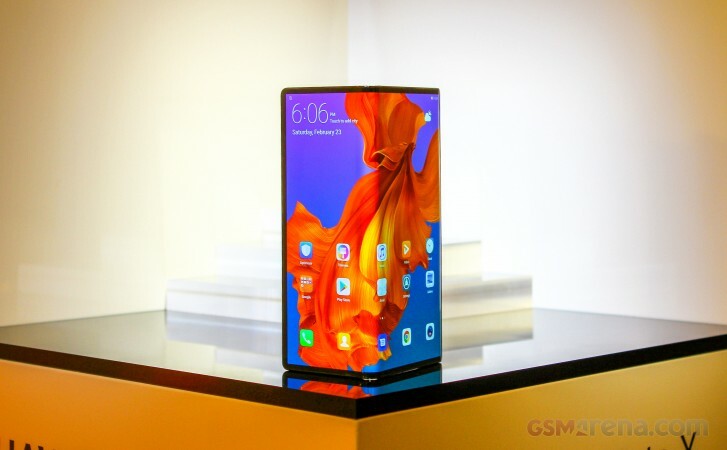 As times fly, the costs will reduce, I think in two years foldable phones will have a similar price to current flagship phones. Still some people will prefer normal smartphones and others will prefer foldable ones. Would you say half of your devices in a few years will be foldable? It’s difficult to say, I think that on a flagship level in two years, half of our devices could be foldable. I really enjoy using the Mate X. I use it for work all the time, it's really useful having the larger screen when reading charts and graphs or just for browsing the web. Is the Mate X your primary phone right now? And in the future do you think you’ll have smaller foldable devices, maybe half the size of a regular phone? For sure, as I said I really enjoy using the Mate X for work, and the P30 Pro for everything else, especially the camera it’s really good. In the future we can make a foldable phone sized in half of this one [P30 Pro], we have plans for a smaller foldable phone. Is Huawei planning to add its own voice assistant at some point? So, for now, we have our voice assistant (Xiaoyi) for the Chinese market but we rely on Google Assistant and Amazon Alexa in other markets because of the ecosystem. In the future, we plan on adding our own voice assistant. For now, Google and Amazon are doing better than us outside of China and we should give the best experience to the consumers. Nobody doubts Huawei is one of the best manufacturers in terms of artificial intelligence, what's the next step in AI for mobile phones? What kind of AI capabilities will you introduce in new Huawei devices? I think AI is a general purpose feature, with our phones we provide this AI processing power to all app developers to support their ideas. For example, we have third party app developers creating apps for autonomous driving and for visually and hearing impaired people. We use AI to enhance the performance and photography of our phones. We are not trying to do everything by ourselves, we are trying to leverage out AI processing capabilities for app developers to bring amazing new features. We are trying to leave AI in the imagination of the developers while improving the performance of our phones. Switching over to 5G, the European Union decided not to ban Huawei from building 5G networks so when can we expect to see Huawei’s first 5G devices in Europe? Of course, the US government is trying to limit us but we have the best 5G technology so the carriers still trust Huawei. Our 5G technology is far ahead of the others, maybe I’m not being humble but I can say Huawei is at least one and a half years ahead of the closest competitor. I think everyone wants 5G so I have confidence that more and more carriers in more and more countries will choose Huawei’s 5G solutions. Commercial 5G will be available in the middle of 2019, around May-June. Our first devices will be the foldable Mate X and the 5G variant of the Mate 20 X and they will begin shipping from June. This fall, alongside the leading carries, we will be able to see the global 5G launch specifically in China, South Korea, and some European countries. Nowadays every single company claims that they have a bezel-less smartphone but we can clearly see that most of them have thicker chins, do you have any solutions to this problem? If you take a look at the P30 you can already see the bottom bezel is really small. In fact, the P30 bottom bezel is even smaller than that of the P30 Pro. We can make the chin shorter but it wont be comfortable to use the phone that way. The reason why we haven’t completely removed the bottom bezel is because of accidental touches. If there was no chin, every time you swipe from the bottom there would be inadvertent presses and that's not convenient. What we are focusing and we believe is more important is to shrink the side bezels. There should definitely be some space on the bottom of the screen so that you can use your device more confidently. In the last year we have seen impressive growth of your Consumer Business Group, do you think you can repeat the growth rate this year? For sure! Our fiscal year is the same as the calendar year. In January and February, we have an even stronger growth compared to last year. Can you guess our growth speed this year's January and February? Our growth speed is already more than 50% compared to last year! Disclaimer: We attended a group interview with fellow media and industry analysts in the same room so not all the questions answered in the text came from GSMArena. https://www.forbes.com/sites/thomasbrewster/2018­/02/26/government-can-access-any-apple-iphone-ce­llebrite/ Seems you donÂ’t know what are you talking about it lol. Another apple-trump blinded consumer who forgets Apple / NSA did spy on US and global citizens / governments etc. Meanwhile, there has been NO proof whatsoever about those claims agains Huawei.